Mariquita's Mystery Box included a gorgeous head of Savoy cabbage - and after contemplating several ideas, including kim chi - I remembered my grandmother's cabbage rolls, read a few recipes and decided to approximate my grandmother's version using her recipe of Pottsville Relish which I have made up every year since college (so I always have some on hand til early summer, at least!). 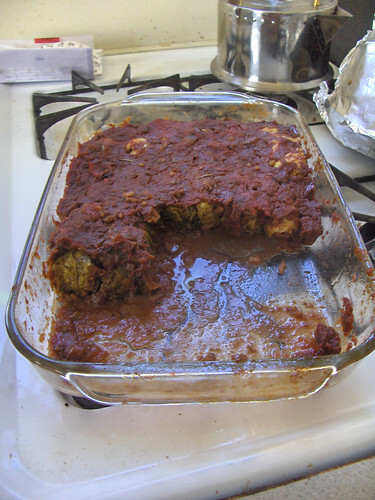 Her cabbage rolls were stuffed with rice, onions and some ground beef, swimming in a sweet & sour tomatoey sauce. It was always the sauce and the cabbage part that I liked best - the tomato not too thick, not too sweet and still savory. Most of the recipes I read either called for using cooked rice or uncooked rice (and rolling looser rolls). This recipe has two parts, the filling and the sauce. I have included alternate instructions for ingredients that you may not have on hand. In a large pot,place sufficient water and a steamer basket, bring to boil and put your washed head of cabbage inside. If the lid won't fit, improvise with a stainless steel mixing bowl. Let the whole head of cabbage steam on a med-hi simmer while you prepare the filling. I turned my cabbage over once, let the water nearly boil down and left it on the stove with the lid on until the very end. Turn heat to a simmer - this smaller pan will be your filling pan and you will add a few more batches of ingredients to it. You want the broth to absorb into the rice but you don't want it to stick. If you have an open bottle of cooking wine, add 1/4 - 1/3 c to the rice while it simmers. For chanterelles, you want to put a lid on the pan and heat these until they throw off some liquid - drain that into the rice and return the pan to heat. The mushrooms will put out a bit more liquid - then you can just add them to the rice & broth. For other mushrooms, heat until softened and add to the rice & broth. Once carrots start to soften, add all vegetables to the rice & chanterelles in the other pan and mix together. Reduce the temperature. You want the broth to absorb into the rice, but you don't want it to stick. Test the rice - it should be undercooked by at least 50% when you shut off the flame to let it cool. NOTE: Taste your filling! Does it taste good? Do you just want to sit down with a bowl of it or reserve i as a side dish? Check your spices, adjust if necessary. Cook down the sauce, taste it, adjust seasonings & spices as necessary. We're going for sweet & sour but still savory - not too sweet! not too sour! Turn heat down to med-low and simmer. At this point, your cabbage should be cooling off and your filling should be cooling off, too. I let my sauce simmer for about 30-45 minutes, your time may vary based on the amount of water in your tomato sauce (my tomato sauce was very watery!). Prep cabbage by pulling the leaves off. Using scissors, cut off the thickest part of the spine with a V-cut. Make a nice big stack of leaves on your cutting board or plate. Your filling should be cool enough to handle - take some and form a small ball - maybe 1/4 cup. Place it in a cabbage leaf - fold up the cut ends across each other, then the sides, then firmly roll and place into the pan with the loose side on the bottom. Repeat until you fill your pan. Cover the rolls with the sauce from your skillet. If it seems a bit thick - add a bit more sauce from your reserve or from the extra half pint - smooth with the back of a spoon. Cover the casserole with foil or a lid and bake at 375 for about an hour -- you want it to be nice and bubbly, with sauce thickening up on top, water from the sauce working down into the rolls to finish cooking the rice inside the rolls. YIELD: 10 x 16 baking dish of 16-20 rolls, depending on your cabbage and how you roll'em! You could also put some rolls and sauce into glass or metal baking dishes to freeze and heat up later (yum!) - if you have that kind of space in your freezer! Postscript: many of the ingredients came from my own yard (herbs mostly) or from Mariquita (carrots, spring garlic, red onion, savoy cabbage, San Marzanos for tomato sauce, red jalapenos that I smoked and preserved, sweet peppers & tomatoes in the Pottsville Relish, even the cayenne peppers that I dehydrated and made into flakes!). I've been struggling to know what to with cabbages, and this looks like a hearty dish. 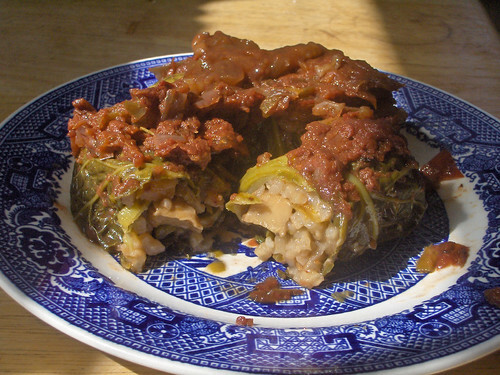 These cabbage rolls are inspiring, Jenn. I cannot believe the bounty of mushrooms you harvested! That is very impressive.